Which statement best describes the operating principle of a constant-speed propeller? A high blade angle, or increased pitch, reduces the propeller drag and allows more engine power for takeoffs. As throttle setting is changed by the pilot, the prop governor causes pitch angle of the propeller blades to remain unchanged. 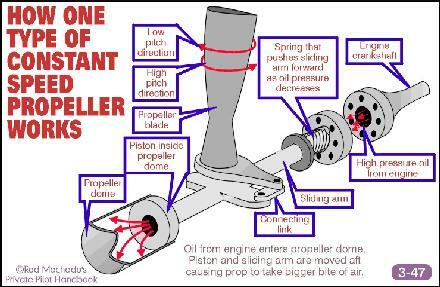 The propeller control regulates the engine RPM, and in turn, the propeller RPM.